From the early 18th century, pleasure gardens – outdoor complexes that offered landscaped vistas, various entertainments, and refreshments – were popular escapes for New Yorkers starved for open space in the rapidly expanding city. Central Park was not established until 1857. 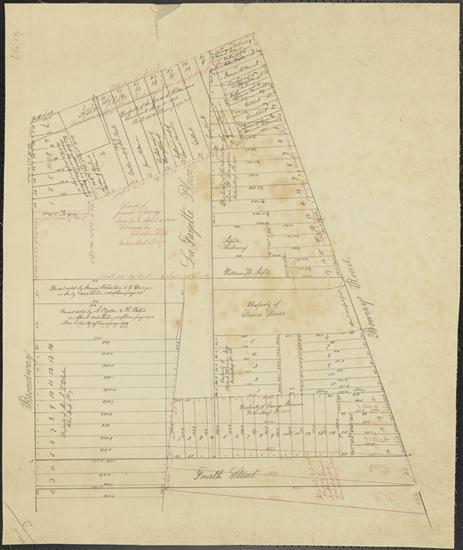 In 1835, when the Tredwell family moved to fashionable Fourth Street (well within the boundaries of the elite “Bond Street area”), the neighborhood was in the midst of significant development. One enormous change was the transformation of the pleasure garden know as Vauxhall Garden into residential and commercial properties. The Garden, which abutted the Tredwells’ rear garden wall, originally occupied a three acre area bounded on the south by Fourth Street, on the north by Art Street (now Astor Place), west by Broadway, and east by the Bowery Road (now 4th Avenue). It was the third and final iteration of Vauxhall Garden. But the land that became Vauxhall Garden had been well known, in the mid-to-late 18th century, as the site of Sperry’s botanical garden. 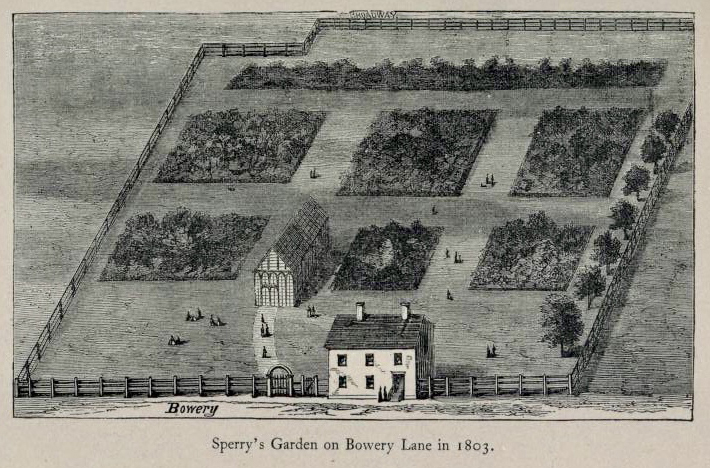 Sperry’s Garden on Bowery Lane, 1803. 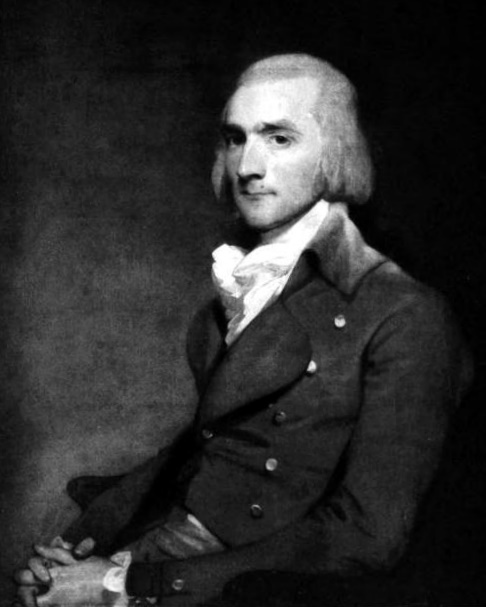 John Jacob Astor, photogravure after painting by Gilbert Stuart. Imagine Seabury Tredwell as a young single gentleman, riding up to Sperry’s to purchase a posey for a young lady! Sperry cultivated the land until 1803, when he sold the property to John Jacob Astor for $45,000. 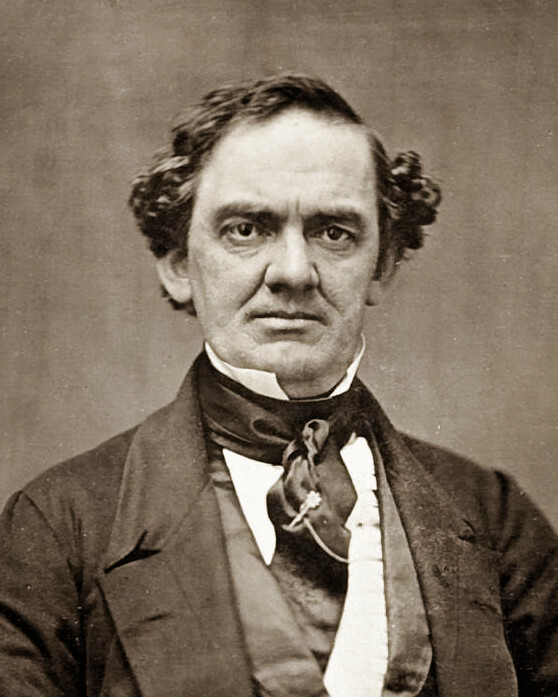 Astor, who had turned his attention from the fur trade that brought him great wealth to the acquisition of real estate, undoubtedly realized that the property’s value would only increase as the city’s population migrated further and further uptown. Once it became a British colony in 1674, New York adopted the customs and manners of the mother country; tea-drinking became extremely popular. To quench the public’s thirst for this beverage, Samuel Fraunces (popularly known as the owner of the tavern that still bears his name), opened the first Vauxhall Garden, named after London’s famous Vauxhall, in 1767. Along with tea, it served other beverages, hot rolls, and the new “ice cream” dessert. Situated on a hill near Greenwich Street between what is now Warren and Chambers Streets, it afforded sweeping views of the North (Hudson) River. In addition to admiring the flowering shrubs and trees, guests strolled through the wax museum, and were awed by the fireworks displays. After the Revolutionary War, Fraunces sold the property and the site became a pottery. The second Vauxhall Garden, located near present-day Grand and Mulberry Streets, was established in 1798 by Joseph Delacroix, a Frenchman who had previous careers as a distiller and confectioner. He operated the garden until 1803; upon learning that Sperry’s former garden was for rent, he immediately obtained a 21-year lease from its owner, John Jacob Astor. It was here that Delacroix achieved fame and fortune, for the third and final Vauxhall Garden became one of the most popular and fashionable attractions in the city. 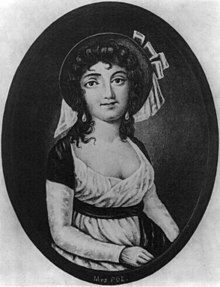 Elizabeth Arnold Poe (Library of Congress). Vauxhall Garden’s season ran from May through September. To keep out those who were “not genteel in character,” and to avoid use of the Garden simply as a place to promenade, Delacroix charged an admission fee of 2 shillings per person, which entitled the visitor to “one glass of any refreshment.” For his patrons’ convenience, and for a small fee, he engaged a special coach to make round trips from the City Hotel, located on Broadway and Cedar Street, to the Garden. 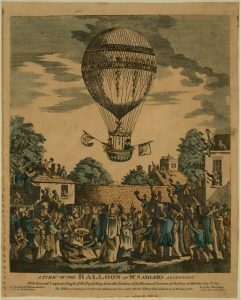 As early as 1806, huge crowds were drawn to Vauxhall Garden to see the popular balloon ascensions, and numbered nearly 20,000 for special events, especially for the elaborate Fourth of July fireworks spectacular. 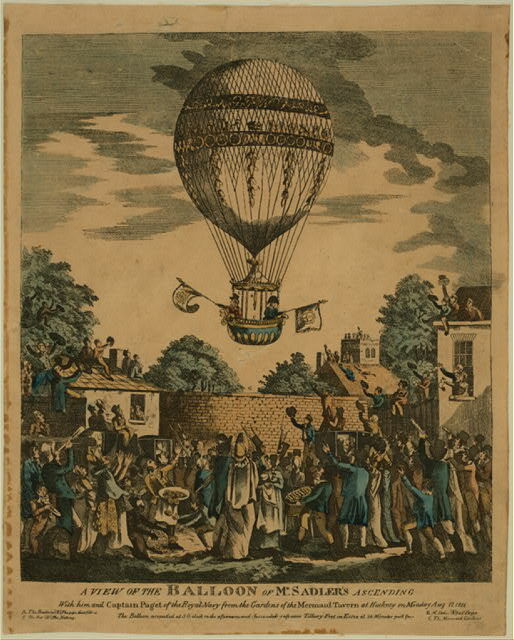 Delacroix’s advertisement in the Evening Post, June 24, 1805, gave a preview of the grand display that was to come. The slow decline of Vauxhall Garden began after 1820; Delacroix’s son, Clement, who succeeded as owner, simply did not have the name cachet to attract the public.The greatest blow came in 1826, however, when John Jacob Astor opened broad Lafayette Place, which extended from Great Jones Street to Astor Place, and cut right through the heart of the establishment. The new street ran parallel to Broadway and the Bowery Road, thus reducing the Garden to half its original size. Joining coveted properties on Bleecker, Bond, and Great Jones Streets, Lafayette Place became a fashionable residential street, especially after fancy LaGrange Terrace was built in 1833. But the meager profits earned after two seasons of managing Vauxhall Garden were not enough for the ambitious Barnum, who went on to more lucrative ventures. The event that no doubt doomed the Vauxhall Garden to its eventual demise was the Astor Place Riot on May 10, 1849, which took place outside the Astor Opera House, just steps away from Vauxhall. A violent encounter sparked by the rivalry between two actors, one British and one American, but reflective of the growing class tensions in New York, the melée left 22 dead and more that 150 injured. At least one of the wounded allegedly died on a billiard table in Vauxhall Garden. 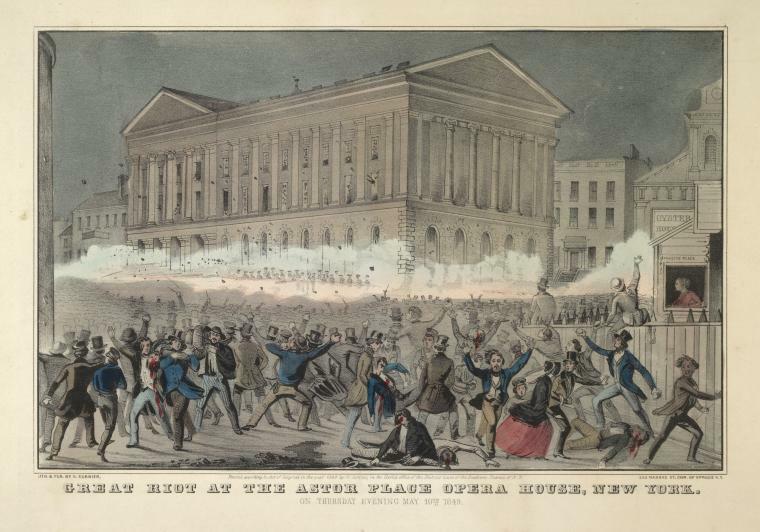 “Great Riot at the Astor Place Opera House,” 1849. NYPL.org. When the Astor Library (now the site of the Public Theatre) was built in 1853, Vauxhall Garden was whittled down to one eighth of its original size. The Bowery, lined with taverns, became the destination for those seeking risqué entertainment; the Garden ultimately was reduced to a shabby vaudeville and burlesque house and saloon, and became a popular site for political meetings. It closed in 1859, a victim of commercial ventures and the urbanization of New York City. It is doubtful that the Tredwell family would have frequented Vauxhall Garden; its attractions were losing popularity among the elite by the time the family arrived at Fourth Street in 1835. They need only step into their back yard to hear the music, see the fireworks — and in the Garden’s waning years, be disturbed by the rowdiness of its clientele. Bayles, William H. Old Taverns of New York. New York: Frank Allaben Genealogical Company, 1915. www.archive.org. Accessed 1/9/18. Bristed, Charles Astor. The Upper Ten Thousand: Sketches of American Society. London: John W. Parker and Son, 1852. www.babel.hathitrust.org. Accessed 1/5/18. Burrows, Edwin G. and Mike Wallace. Gotham: a History of New York City to 1898. New York: Oxford University Press, 1999. Dayton, Abram Child. Last Days of Knickerbocker Life in New York. New York: Charles W. Dayton, 1880. www.archive.org. Accessed 1/5/18. DeVillo, Stephen Paul. The Bowery: The Strange History of New York’s Oldest Street. New York: Skyhorse Publishing, 2017. Eaton, Walter Prichard. “Lafayette Place.” In Brown, Henry Collins, ed., Valentine’s Manual of Old New York, New Series, Number 2, 1917-18. www.archive.org. Accessed 1/4/18. The Evening Post, Tuesday, May 10, 1803, p. 4. newspapers.com. Accessed 1/5/18. The Evening Post, Monday, June 24, 1805, p. 2. newspapers.com. Accessed 1/5/18. The Evening Post, Tuesday, August 19, 1806, p. 3. newspapers.com. Accessed 1/9/18. The Evening Post, Friday, January 5, 1810, p. 4. newspapers.com. Accessed 1/5/18. The Evening Post, Monday, June 5, 1820, p. 2. newspapers.com. Accessed 1/5/18. The Evening Post, Thursday, June 25th, 1840, p. 3. newspapers.com. Accessed 1/6/18. Hemstreet, Charles. Nooks and Corners of Old New York. New York: Charles Scribner’s Sons, 1899. www.archive.org. Accessed 1/6/18. Kaplan, Justin. When the Astors Owned New York. New York: Penguin Group, 2006. Lamb, Martha J. “A Neglected Corner of the Metropolis,” Magazine of American History, Vol. XVI, No. 1, July, 1886. www.babel.hathitrust.org. Accessed 1/2/18. Lockwood, Charles. Manhattan Moves Uptown. Boston: Houghton Mifflin Company, 1976. McCabe, James D. Lights and Shadows of New York Life; or, the Sights and Sensations of the Great City. Philadelphia: National Publishing Company, 1872. www.archive.org. Accessed 1/2/18. Mitchill, Samuel L. The Picture of New-York, or, The traveler’s guide, through the commercial metropolis of the United States. New York: I. Riley & Co., 1807. www.archive.org. Accessed 1/4/18. 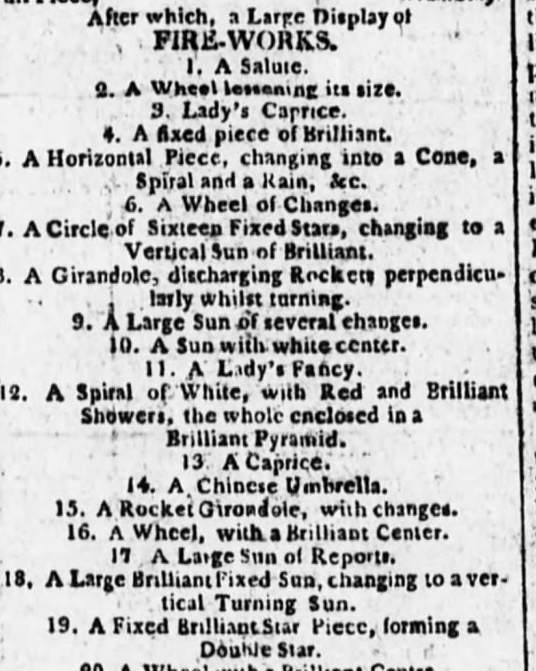 New York Daily Herald, Saturday, March 24, 1855, p. 1. newspapers.com. Accessed 1/9/18. New-York Tribune, Tuesday, July 11, 1843, p. 2. newspapers.com. Accessed 1/6/18. The Sun, Wednesday, October 12, 1859, p. 3. newspapers.com. Accessed 1/7/18. Ukers, William Harrison. All about Tea, Volume 1. New York: The Tea and Coffee Trade Journal, 1935.